Along with the nearby Minet library, the plan was to hand over the public asset to Greenwich Leisure Ltd (GLL), a not for profit organisation. GLL plans to convert these into what have become known locally as 'book-ish gyms'. No costings or logistic of combining a library with a gym have yet to be produced. Lambeth Council claims: "It is important to set the record straight. Carnegie Library will re-open in early 2017 as a Healthy Living Centre with a refurbished neighbourhood library, new computers, the same book stock and study space. It will also be open for longer hours." The argument from the Labour local authority is that Tory government cuts has led them to make these changes. "Lambeth council has to find £238m in savings between 2011 and 2018 which equates to half of its core funding." Local Labour party members have responded to these claims. The Dulwich and West Norwood Constituency Labour Party even went as far as passing a motion criticising the plans to convert the Carnegie and Minet into book-ish gyms. The local party members point out: "A library without professional staff will be unable to perform some of its most crucial functions, and thus will cease to be a library at all. The ‘longer opening hours’ will be for the gym and self-service lending facility. Library hours will cease to exist. The route that led to book-ish gyms is long and complicated. The Lambeth Co-operative Libraries programme (PDF) back in 2012 declared that none of the 10 libraries in the borough would close. Government cuts continued to hit hard in the borough, which led to the Cultural Consultation at the start of 2015. The original idea was to sell the Minet and Waterloo libraries, and stop funding for the Carnegie, Durning and Upper Norwood. The money raised from the sales would be handed to the community to self-manage. GLL, meanwhile, was attending 'Co-operative Partner' closed meetings with Lambeth Council as far back as 2012. It has been claimed that this gave the organisation an insider advantage when it came to offering the council an alternative to the original proposals. The Cultural Consultation fire sale idea was then scrapped. The Waterloo would still be sold on, but the Carnegie, Minet and now the Tate South in Vauxhall would become book-ish gyms. There are even plans to explore replacing the Minet with housing. Large protests followed. Cllr Jane Edbrooke, the Labour Cabinet member for Neighbourhoods, did something of a minor U-turn. The Tate South was given a reprieve on the eve of a demonstration, but only until another location could be found in the north of the borough. Cllr Edbrooke has since been moved to a different Cabinet role. Local MP Kate Hoey has been incredibly supportive of the library campaign, appealing to her fellow Labour party members to abandon the book-ish gyms project. "I just do not accept that there is not another way to preserve our hugely important libraries," she said. 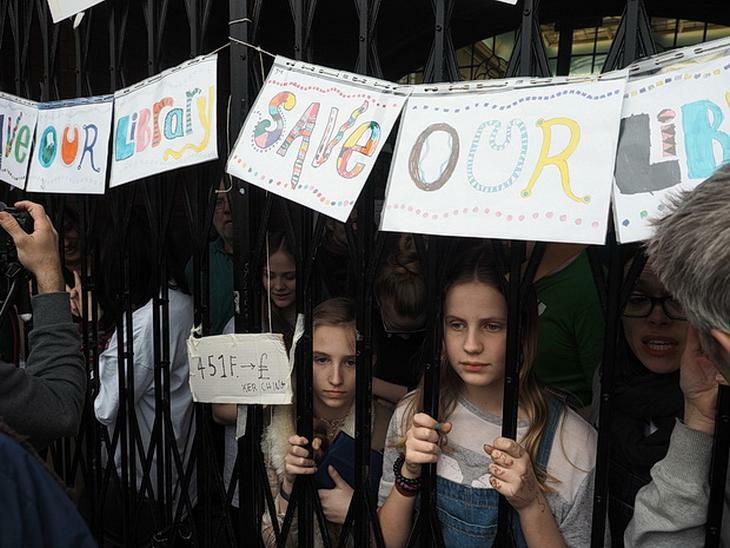 "I understand that there was an internal report drawn up by the Head of Libraries which would have allowed all our libraries to remain within the financial constraints." This refers to the Barnes proposal — an alternative put forward by Susanna Barnes, the current Head of Libraries in Lambeth. This fully costed model would have led to all 10 libraries remaining open, and all being run by a staff mutual. Lambeth Council rejected this idea in favour of the as-yet-uncosted GLL model. Dulwich and West Norwood Labour MP Helen Hayes met with local campaigners on Friday morning. She has agreed to go back to the council and ask for a meeting between the council, Carnegie Friends and the Trust. The existence of the Carnegie Trust complicates matters further. As part of the Co-operative Council process, the Labour group has been keen for an 'independent' group to manage the library. The Carnegie Trust, however, has many close connections to the local Labour group. The Friends of Carnegie Library suspected a takeover. The Trust is now left in an awkward position of not wanting to upset the Labour administration, but also being against the book-ish gyms proposal. This has led to the absurd suggestion from the Trust of excavating the Grade II listed Carnegie basement to accommodate a book-ish gym. This has been estimated to cost up to £2m. Meanwhile the Carnegie protestors continue to occupy the building. Lambeth Council was due in court on Friday afternoon to try and obtain Possession Orders against the occupiers. It will actually cost the council more to keep the building closed while GLL comes up with a book-ish gyms business plan, than it would to keep it open. Book-ish gyms have highlighted the tension that government cuts have brought to Labour supporting areas. There is a tremendous sense of disconnect now in Lambeth between the Labour council and local residents. 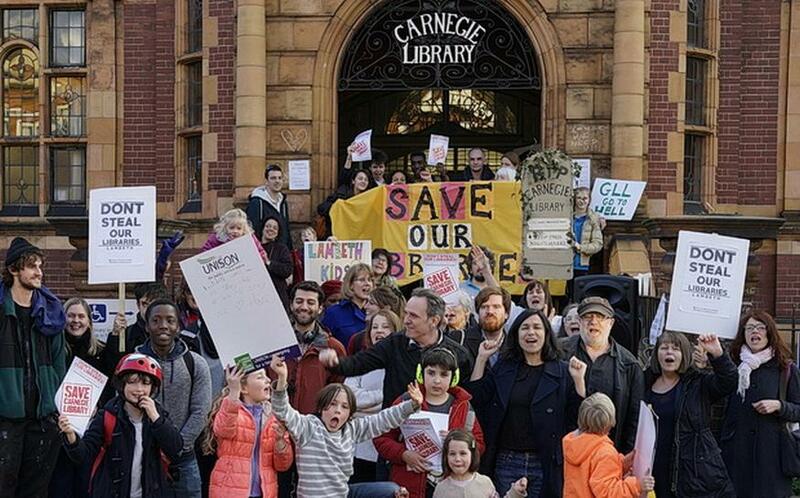 The march to support the Carnegie campaigners starts outside the library at 11:30am on Saturday 9 April. The route will take in the Minet library, and then head towards the Town Hall in Brixton.